If you are backstage at a concert, in the VIP room, or at a fashion week party, more than likely you have seen Myles Hendrik. If you don’t know him, chances are everyone in the room you are goggling at does. That type of worldly magnetism has made the DJ a figurehead in LA nightlife since the initial boom of the electro and indie scenes of the early aughts. 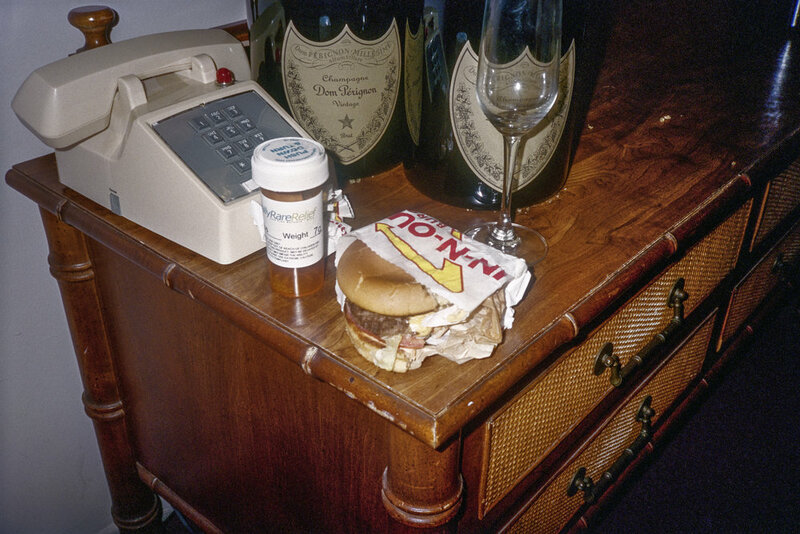 Though constantly with a camera in hand, it was only in recent years that the DJ presented his documentations in a portfolio of work that presents the less glamorous side of Hollywood’s sun soaked matter-of-fact existence. One that depicts the detailed reality of reflective tin foil as diamonds in a glance or what happens when the Dom Préignon has ran dry. Though the documentation of LA’s despair can often be cliché, Hendrik has explored this aspect with an earnest eye taking to express that which he is a part of instead of documenting from an outsiders vantage point. No longer are we expecting the high demands of luxury outings deserving of the gram. The viewer engages with the work as a first hand experience of after the after party, a sense in which we have had our dance, cocktail, and conversations. The daylight presents the iconic signs which dot the cities horizon in a way which questions is it from the vantage point of the morning after or a thought as we walk to grab our dry cleaning. Showing with the FF-1051 gallery the photographer will be presenting at the Photo LA Fair. What would you say sets you apart sonically? Has the fashion world influenced any of your musical outings? Where do you pull from for inspiration? I would say it’s my ability to weave freely and cohesively through different genres into a mix that’s unexpected and fun. It’s somewhat similar to my photographic style where I always look to condense a layered narrative into a single image. Fashion and music go hand in hand. Having a School teacher introduce me to Ziggy-era David Bowie when I was around 10 years old had an indelible impression on me. Not only sonically, but stylistically. Inspiration comes from a myriad of sources: the history of music, the discovery of music, art, poetry, prose, fashion, films. They all conspire into the most wonderful of cocktails. Where are some of your favorite places to DJ? Do you have any favorite sets? I love anywhere that people aren’t afraid to let go and just be in the moment. I’ve been fortunate enough to play all over the world where I’ve played epic parties in forests, raging caverns in Paris, insane tents at Coachella, magical tropical locations, even a party for The Royal Family. Too many favorite sets to mention. What interested you in Djing? I simply love music. I’ve played a myriad of instruments from a very young age. Been in bands, produced music. DJ’ing is just another form of musical expression for me. How would you say the scene is like in LA? I think LA is having a real moment. It’s finally getting the respect it deserves. There’s so much great art, so much creative energy here right now that it’s impossible to ignore. What influences your style or mashup of styles? How do you create new sounds when DJ arenas are so crowded with new voices. How did you make sure electronic music fans heard your voice? I think when you hear me play you know it’s a person that cares about music. That understands music, understands songs. melody, structure. Having played in bands, toured etc, I approach playing a set much like performing a show. It’s all about the journey we’re on together for the night, or the hour or two wherever it may be. And I want us all to be in the ride together. What is your creative process like with this new venture in the studio. What made you want to create original material? I’ve always made music. From my early teens I had bands. Writing songs, like taking photos, filling journals with poems… it’s all very necessary and essential catharsis for me. I have so many literal and virtual songs going on in my head 24/7 that I have to get them out in some capacity. A studio is a great release. Plus playing songs in a set that you wrote and recorded is much like stepping on to a stage with a band. And I think I’m in my most natural state when I’m on a stage. In regards to your photography, do you think Dreams of LA is something that was inspired by your time in spent in the city, soaked in celebrity? Los Angeles has been my home for the past 14 years. It’s such a misrepresented and wildly misunderstood city, so often distilled and trivialized into a miniature Hollywood Sign fridge magnet. The wonderful cultural diversity, the intricately woven beauty that ricochets like mad cannons deep in the fault lines is passed over. Missed like all its careful angles, it’s truths and it’s yearnings, it’s hope and it’s blinding romance. But I see it, and I keep searching for it. For me it’s about getting the honesty, that window to the invisible story. That’s what I’m interested in. And Los Angeles has inspired my work in a way that few other places I’ve visited have. Each of the photos I’m showing at Photo LA are in themselves love poems to this city. Although you work for high profile artists, your photgraphs are less pristine, gritty and free, are you peeling the mask off? Yes exactly. Even at a young age, when my dad gave me my first 35mm camera at around 12-13 years old, I was always looking for the lines beyond the surface, the the invisible prairies. For me it’s about getting the honesty, that window to the invisible story. That’s what I’m interested in. I’m always looking for, the poem within. What inspires you to take a photograph? Are you inspired to make music from what you see, or to photograph something based on what you are listening to? The process, whether it be taking a photo or creating music is always intuitive. It’s never analytical. With a photograph I take there’s always a level of tension compelling me to take it. I’m trying to capture the unflinching honesty that caught my eye in the first place. I think because I’ve played instruments and taken photos from a young age, somewhere within the reaches of my creative process they absolutely influence each other. Images are musical, poetic and songs are pictures, stories, poems. “A camera has been at the end of his wrist since the day I met him. It’s part of his person. Walking down the street with him, his eyes are always scanning for the hole in the paper maché, the extra vision. While the heavenly palms scratch the sky all the colors of cake, Myles points his camera and captures the coin drop. He sees us here, and he sees this place in us”. Myles Hendrik at FF-1051 will be on display at Photo L.A. from Jan. 31 to February 3rd, 2019 in Santa Monica.